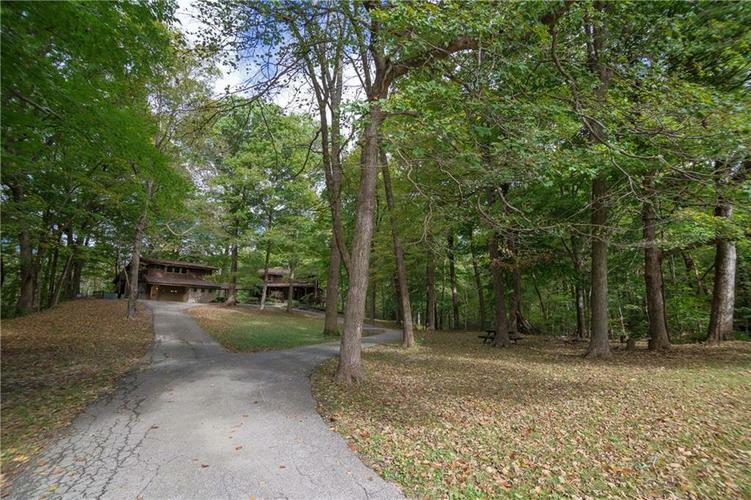 Breathtaking private wooded setting on over 7 ACRES with a scenic winding creek! Tucked back on a private lane you'll find this peaceful paradise. This home is really an entertainers dream! An infinity pool with a waterfall ledge really makes this home feel luxurious and offers a huge deck and patio area! The carriage house has a 2-car garage plus a FINISHED STUDIO making it a great place for guests to stay! There is also a huge 28x48 pole building - perfect for storage, projects and more! Hardwood floors throughout the first floor. The walkout BASEMENT offers an additional bedroom, rec room, 2nd kitchen, bathroom and theater room! Don't miss out on this one of a kind cabin in the woods! Located just 15 minutes from Purdue University!